The Pipeline snakes through the landscape, at once leading and following you from the thinning boreal forest toward the treeless tundra as you drive northward on the Dalton Highway, the sole road from Fairbanks in central Alaska to Prudhoe Bay on the Arctic Ocean coast. The 800-mile-long steel axon connects the subterranean crude oil reserves of the Arctic Ocean to Valdez, on the south coast of Alaska, for shipment and refinery. Its presence disrupts the seemingly pristine and wild panoramas offered from the highway, a constant reminder of the disturbance on this environment by modern life. From a distance, the tundra appears to be a smooth green carpet of vegetation, interrupted by the occasional shallow kettle lake or the pools and narrow channels of a beaded stream. With a finer focus, though, the tundra is revealed to be a rough, uneven surface of mound-like plants called tussocks (mainly Eriophorum vaginatum), with the inter-tussock spaces occupied by mosses, lichens, and other low-lying species. Walking across tussock-laden tundra requires attention, agility, and strong ankles. The columnar growth of these plants, the many temporary pools of water that accumulate from rainfall and thaw, and the spongy sphagnum moss–covered ground prohibit going anywhere quickly. Although canopy height rarely breaks one meter, the heterogeneity in water, nutrient, and light availability across tundra microhabitats provides opportunity for diverse plant life. 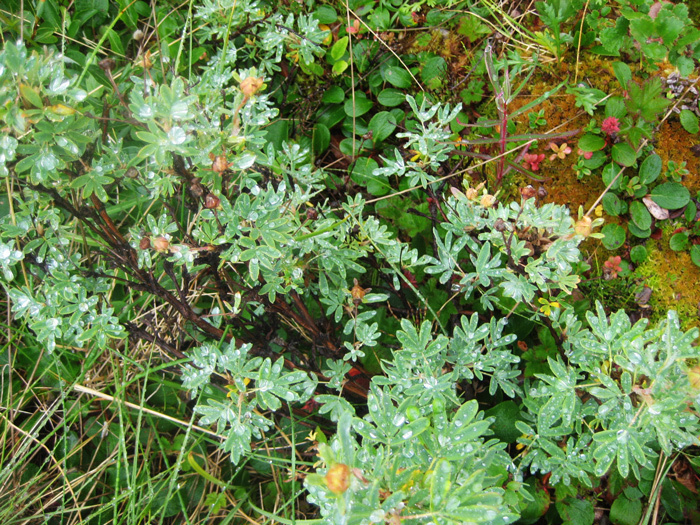 While evergreen tussocks dominate most of the tundra, deciduous shrubs such as Betula nana (dwarf birch) and Salix pulchra (diamond-leaf willow), evergreen shrubs of the Vaccinium genus (bog cranberry and bog blueberry), and a myriad of small flowering herbs including Rubus chamaemorus (cloudberry) and Ledum palustre (Labrador tea) make up the tundra plant communities and provide food for animals ranging from migratory songbirds to caribou and grizzlies. In season, the pink, purple, and yellow flowers of these species add contrast to the otherwise green and brown landscape. Though, when the tussocks are in full bloom the tundra can look snow-dusted, densely spotted by the tussocks’ cotton-like flowers. 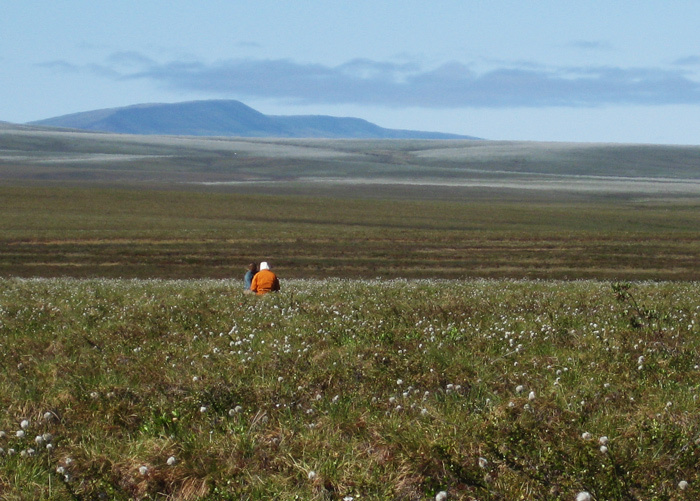 Plants of the arctic tundra must be adapted for multiple environmental stresses: nine months of darkness, snow-covered winters, a short growing season with twenty-four hour photoperiods, limited nitrogen and phosphorus supplies, extreme temperature and precipitation variation during the growing season, and permafrost, which lies only a couple dozen centimeters below the surface year-round. Permafrost defines tundra vegetation; the impenetrable layer of frozen soil and ice constrains rooting depth, limiting the stature of plant life and preventing tree species from occupying this landscape. Research from the past few decades indicates that the tundra is “greening”, and this may not be a good thing. While rates of warming vary across arctic regions, average temperatures in northern Alaska have increased in the last half-century. This warming leads to increased permafrost thaw throughout the region, allowing for the northward extension of the tree line and the expansion of woody shrub species. The “shrub invasion” threatens to alter the historic plant communities and how they compete for limited nutrients during the short growing season. The relatively taller stature of these shrubs creates a novel physical environment with snow during the winter. Snow packs less densely on shrubs, creating an insulting layer of warmer air between the snow and the soil, allowing for more soil-microbial activity during cold months. This insulation provides the shrubs with more available nutrients come spring, which can enhance their competitive advantage for nutrient acquisition. The looser snow-pack on shrubs, in tandem with the warming temperatures, leads to earlier snowmelt in the spring, extending the growing season. Warming also threatens to alter perhaps the most valuable aspect of the Alaska tundra—its carbon. The organic carbon stored in high latitude soils and vegetation accounts for approximately one-third of the global carbon pool. 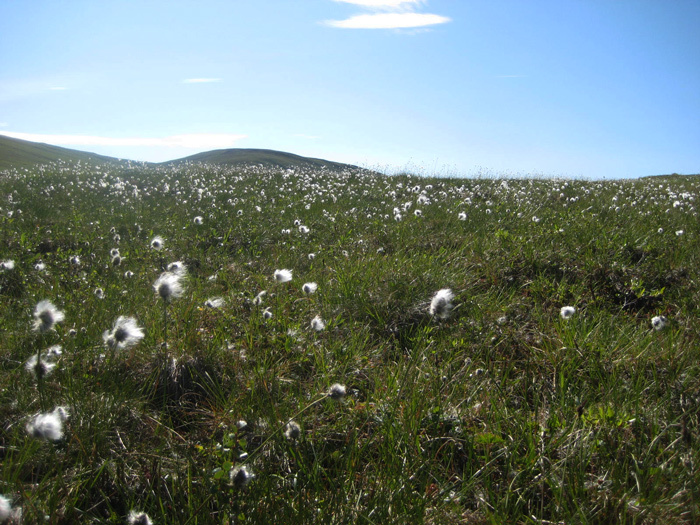 Over millennia, the balance of photosynthesis and respiration by plants and decomposition by soil organisms, which control carbon accumulation, has led to the vast carbon reservoir that lies below the tundra’s surface. However, the trend of warming in this region may shift this balance, limiting the tundra’s ability to store carbon and potentially releasing the stored carbon back into the atmosphere. Current research is examining the extent of the shift of this balance, as well as the impacts of warming on other cascading ecological factors, such as biodiversity and nutrient cycling. Change is not a new phenomenon for this region; it was previously covered by ice, and fossils of ancient sea life can be found on short day-hikes in the nearby mountains. However, the ability of the existing plant life to adapt and the timing of this adaptation to current and future effects of climate change are only beginning to be understood. A native of sub-tropical Florida, Mary Heskel currently lives in New York City, where she is working on her dissertation on leaf-level carbon cycling in arctic plants at Columbia University.